Netflix's hit sci-fi show Stranger Things is back for a second series and its bigger budget makes it even more ambitious. Set in Halloween 1984, several new characters feature, ready to fight the Demogorgon as it returns to Hawkins. Mike and his mates get a new best friend in the form of Max, played by Sadie Sink. The famous love triangle between Nancy, Steve and Jonathan is also set to continue. Stranger Things takes its cue from films and shows of the 1980s. The second season takes this further with the addition of Sean Astin to the cast. The actor - who played Mikey in The Goonies - plays the love interest of Joyce Byers, played by Winona Ryder. We also know Eleven, played by Millie Bobby Brown, is back (and is no longer bald!) after disappearing at the end of the last series. We don't know if she and Mike are going to get together, though Caleb McLaughlin - aka Lucas - has teased he's getting a love interest of his own. Here's everything you need to refresh your memory before you get started on season two. Series 1 starts in November 1983 when Will Byers (Noah Schnapp) disappears and a girl with a shaved head called Eleven escapes from a government lab. Will's friends - Mike (Finn Wolfhard), Dustin (Gaten Matarazzo) and Lucas (McLaughlin) use Eleven, who happens to have telekinetic powers, to try to track Will down. Will's brother Jonathan (Charlie Heaton) and Mike's sister Nancy (Natalie Dyer) then get involved after Nancy's best friend Barb also disappears. Will's mum Joyce (Winona Ryder) realises she can communicate with her son through electricity and gets the town police chief Jim (David Harbour) involved in the plan to find him. It turns out there's an alternative reality to Hawkins, which is dark, stormy and cold and has a monster called the Demogorgon living in it. The Demogorgon feeds on blood, which explains why Mike and Barb (Shannon Purser) both go missing. They're both trapped by the monster after having an accident leaves them bleeding. Viewers also discover that Eleven was kidnapped at birth and trained by the government to be a spy to listen in on the Russians. The evil Dr Brenner (Matthew Modine) has manipulated Eleven for her whole life and spends the series trying to get her back after she escapes. But her amazing powers mean she can kill his henchmen with her mind. Joyce and Jim enter the alternative reality and eventually find Will, who's been kept captive by the Demogorgon. Nancy and Jonathan lure the monster to his house in an attempt to kill it. They set lots of traps and think they've killed it with the help of Nancy's boyfriend Steve (Joe Kerry). 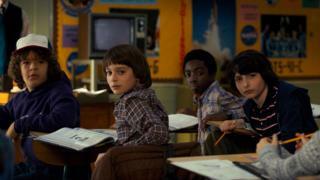 But it soon reappears at Hawkins Middle School, where Mike, Dustin and Lucas are hiding Eleven. At the same time, evil Dr Brenner and his henchmen arrive. Eleven kills most of the men and saves her friends, but both she and the Demogorgon disappear. What will become of Eleven, Dr Brenner and the Demogorgon is season two? Stranger Things 2 is now available to stream on Netflix.